Britain’s Conservative government has used a second alleged novichok nerve agent poisoning incident in the Salisbury area of England to launch a fresh provocation against Russia. Based solely on previous and unproven accusations that the Putin regime was responsible for the attempted assassination of double-agent Sergei Skripal and his daughter, Julia, Moscow is now accused of responsibility for a “collateral damage” incident that has left two British citizens in a reportedly critical condition. 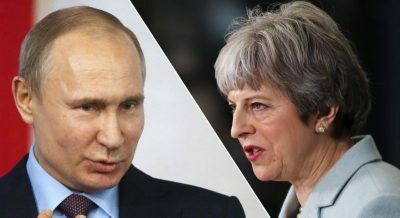 The circumstances surrounding the latest accusations are as dubious and baseless as those initially made regarding the March 4 incident, which led to a global diplomatic rupture as Prime Minister Theresa May and Foreign Secretary Boris Johnson secured the agreement of the US and other allies to expel more than 100 Russian diplomats. UK Security Minister Ben Wallace yesterday identified Russia with the poisoning of Dawn Sturgess, 44, from Salisbury, and Charlie Rowley, 45, from Amesbury—located just seven miles away. “The working assumption would be these are victims of the consequences of the previous attack or something else but not that they were directly targeted,” he told the BBC. Wallace spoke less than 24 hours after Neil Basu, Britain’s top counter-terrorism officer, told the media that scientists at the Porton Down chemical weapons facility had supposedly identified novichok exposure as the reason for the couple’s collapse. It is the UK government who should properly be asked to explain what is going on. The timeline of events leading up to these latest accusations is extraordinary. The first time the alleged poisoning in Wiltshire came to national attention was Wednesday morning, July 4, as police said that they were now questioning their earlier hypothesis that the two had been made ill by contaminated heroin or crack cocaine and were seeking the assistance of Porton Down. Novichok was confirmed as the apparent cause later that evening. The two supposed victims fell ill on Saturday, June 30—with Sturgess taken to hospital after 11:00 a.m. and Rowley at 6:30 p.m. To believe official accounts of the extraordinary delay requires accepting that Rowley being a registered heroin addict and Sturgess a drug user created such confusion that no police officer considered the possibility of a connection to the Skripal affair. This is despite the two being found at an address just seven miles from Salisbury and reportedly showing symptoms very similar to the Skripals. Only yesterday did reports finally appear supposedly explaining how the two had possibly been exposed to novichok—miraculously overlooked by a clean-up operation involving hundreds of police officers and others costing over £10 million. British officials previously said that the novichok agent used on the Skripals had not proved lethal because it was delivered as a gel smeared on a door-handle and would have by now been rendered completely ineffective by being broken down by water and evaporation. To account for a nerve agent used four months ago still having such a devastating effect, it is suggested that Rowley was visiting Sturgess, who became homeless and lives in the John Baker House hostel in Salisbury, when they found and for some reason picked up an undiscovered syringe containing the novichok used against the Skripals while visiting the Queen Elizabeth Gardens park, near where the Russians were found slumped on a bench. Chemical weapons expert Richard Guthrie had told BBC Breakfast that if the couple had come across novichok in a syringe “or pot,” it might have been better preserved. Chemical weapons expert Hamish de Bretton-Gordon told the MailOnline that novichok could survive for “months or longer” inside a syringe. The latest account relies solely on the testimony of Sam Hobson, a friend who accompanied Rowley and Sturgess throughout that day and said Sturgess began feeling ill after “touching an item” in Queen Elizabeth Gardens. After Sturgess was taken to hospital, Rowley apparently spent the day picking up his prescription from Boots, visiting a hog-roast with Hobson and then buying red, white and blue hair dye in preparation for upcoming England’s match against Colombia in the World Cup. He fell ill only after returning home to Muggleton Road, run by a housing association. The claim that the police only considered the involvement of chemical weapons later is belied by eye-witnesses, who report that paramedics who came to pick up Rowley were wearing hazmat suits. Neighbour Amy Ireland told the Daily Mail that the estate was packed with firemen, police and paramedics on Saturday. All of this was kept secret for days. And nothing that has since been reported can be taken at face value, given the long record of lies surrounding the Skripal affair. One needs only recall the initial presentation of Sergei Skripal as being long retired, before former British Ambassador Craig Murray revealed in May that D-Notices had been issued to the media to prevent reporting on Skripal’s MI6 handler, Pablo Miller. What is certain is that the UK government has every reason to put a fire under its fast-fading and discredited Skripal provocation. Javid’s citing of the World Cup indicates the degree to which the Tories have been embarrassed by the tournament’s success. With all the main parties, including Labour, and the Royal family boycotting proceedings, the government now faces the prospect of England in the quarter finals and possibly even playing Russia in the semi-finals, with no official presence. More serious still are the growing concerns that President Donald Trump will seek a new modus vivendi with President Vladimir Putin at a summit meeting scheduled for July 16 in Helsinki, Finland, just one day after his long-delayed trip to the UK and a week after July 11-12 NATO summit to discuss reinforcing the military alliance’s eastern operations on the Russian border.